The display, affixed to a building on the Long Island City waterfront, is a clock counting down the time left in Donald Trump's presidency. LONG ISLAND CITY — New Yorkers with views of the East River may have spotted a row of bright-red digital numbers affixed to a building on the Queens waterfront. The mysterious display is actually a clock counting down the time left in President Donald Trump's first term, according to Brandon Stosuy, editor for the art-focused website The Creative Independent, who created the piece with artist Matthew Barney, Jade Archuleta-Gans, architect Jane Lea, light designer Kenzan Tsutakawa-Chinn and other collaborators. 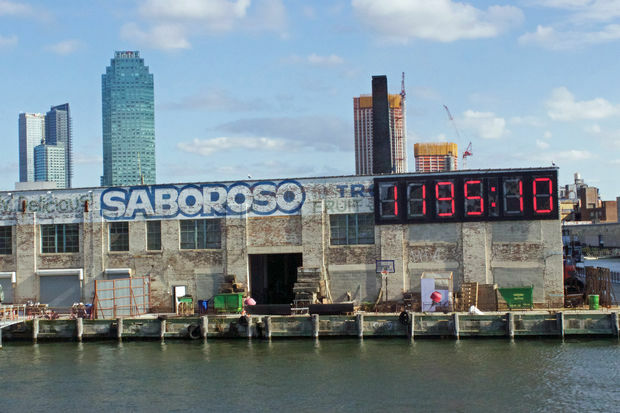 The group erected the huge clock — which shows the days and hours left until Trump's term is up — during a comedy event they organized at Barney's Long Island City waterfront studio at the end of June. "We kept it shadowy on purpose so people could come to their own conclusions," Stosuy said in an email to DNAinfo New York, about not actively publicizing the piece. "People are slowly figuring it out." The sign — located right near Gantry Plaza State Park in Hunters Point — is visible from Manhattan, with riders heading to the new Long Island City ferry landing getting a perfect view. "It's a reminder that a lot [of] people can't wait until it's over, as well as just a reminder," Stosuy explained of the motivation behind the piece. "It's also a bit like a durational test — a reminder to try to hold on until the end." They intend to keep the clock running until the end of Trump's term, "[b]ut if his term ended earlier than planned, it's programmed to jump to zero," Stosuy added. When asked what the clock will do if Trump is elected to a second term, he said they wouldn't bother to turn it back on for another four years. "That'd be too depressing," he said.